If your organization has public folder capabilities, follow these steps to create a Public Folder Calendar in exhcange. Go to Outlook Navigation Bar, Click on the three dots then click Folder to go to the Folder View. In the folder Navigation, scroll until you find All Public Folders. 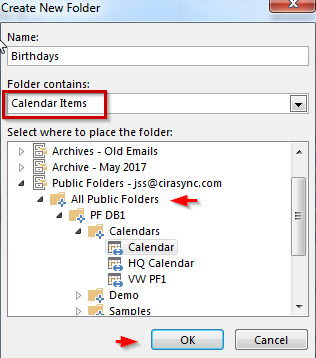 Right click on the Public Folder where you want to create the Calendar and select New Folder. Note that you will need to be an owner of the parent folder to create new folders. In this instance, we enter the name of the Calendar. Here it’s called ‘Birthdays’. Next select ‘Calendar Items’ under Folder Contains and Click OK. Select the newly created Calendar (In this case, newly created Calendar is named ‘Birthdays’). To edit the Permission level for each user who needs access to the Calendar, right click the Calendar and select Properties. Go to the Permissions tab and click the Add button. Search for one or more users or groups. Double-click the name to add, and click OK. I always recommend trying to use Distribution groups instead of individual users. When a new member is added to the group, they automatically get access to the public calendar. If you have multiple public folders, the groups are even more critical — you dont want hand set permissions on a dozen public folders when you can simply modify a group. Now, select the type of Permission Level for each user based on your preference, click OK. The calendar is now available for use. If you’re interested in sharing Calendars within a public folder on Microsoft Exchange 2016, the procedure is identical. To find out information on smartphone access to this folder, click here for more information here.